I was recently given the opportunity to give some thought to the concept of mindful eating in collaboration with Legal & General, the team at Joe Blogs thought this might be of interest to me given my vaguely healthy lifestyle and the fact that I eat a lot! Not one to turn down some free food, I had a look at the blog post that Legal & General have written and said yes! Upon reading their post it made me think a lot about my relationship with food over the last couple of years. Spending 3 nights a week staying in a budget hotel since April 2013 has meant that I haven’t been eating as well as I could have been. Add in the fact that I have been in Switzerland which is not the cheapest location for eating out, and mix in a diet that tries to minimise my carbohydrate intake (or at least try not to eat carbs and fats in the same meal) and it has limited my options somewhat! I’ve eaten a lot of hotel picnics comprising of meat and cheese, or pizza, or McDonald’s but it’s been done in a hurry, whilst focusing on my Open University studies or just feeling exhausted post run. It also made me realise that even when I have been home on the weekend I haven’t cooked much. I used to cook a lot, I would spend 3 hours in the kitchen knocking up a chicken jalfrezi from scratch, sometimes even mixing and blitzing my own Garam Masala mix. Since we moved a year ago though I haven’t needed to do this, we have found an amazing Indian restaurant near where we live and it is much easier to just get them to do the cooking, especially if I have been out running and am feeling tired. So what is mindful eating? Obviously you should go and take a look at the post “Mindful eating for better living” as they explain it much better than I can. I really liked the point they made about it being less about calorie counting and more about being aware of what you are eating. The Boyf and I no longer count calories, and whilst we consider what we eat we don’t have any banned foods. 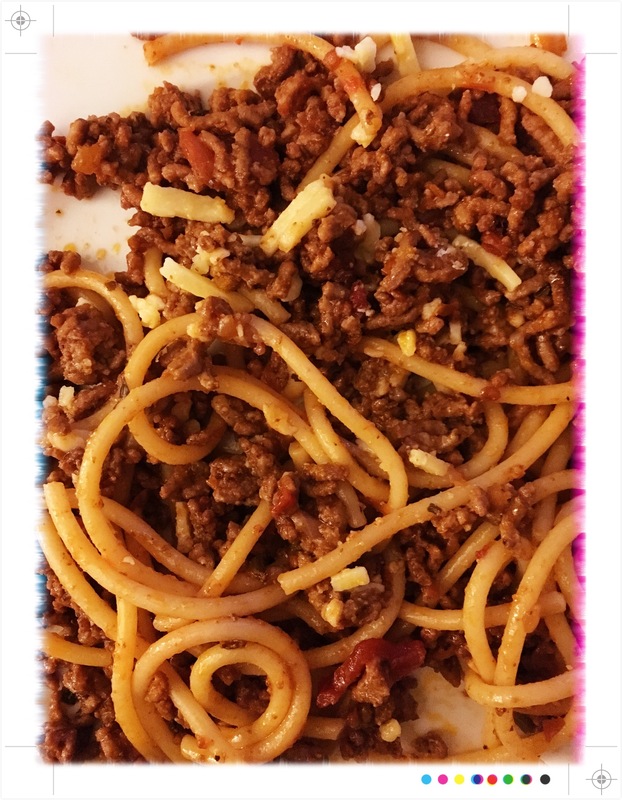 If we want chocolate we eat it, if we want a giant plate of spag bol then we’ll have it (tonight I made spag bol for the first time in 18 months because it was the first time in that long that we really felt like eating pasta). It really works for us as it means you don’t have that panic I have witnessed in others so often when they start a diet. 2 days in they’ve not only eaten cake, but because they feel they shouldn’t be eating it they have somehow eaten THE WHOLE CAKE! The Boyf and I enjoy eating and enjoy going out for meals when we can, but one of the things that may seem odd to those serving us is that we are much more focused on eating than we are on chatting. In all honesty we’re a restauranteur’s dream…we get seated, order, eat and leave. No 3 hour table blocking for us, feed us fast and we’ll leave. We do our chatting as we walk or run, so are quite happy to eat dinner whilst enjoying the food rather than it being a long drawn out “date” where it’s all about us. Working for an agricultural company has also given me fresh insight into the process of the food supply chain, from sowing the seeds to serving it at home on the kitchen table is a lengthy process and one that a lot more complicated than people may think. I remember a time at my last company when I found out the reason it took so long for strawberry smoothies to become part of the menu was down to the lead time needed to secure in advance a year’s worth of strawberry crops from numerous growers just to enable all the restaurants to offer it as a choice. I have really enjoyed spending the last week getting reconnected with food and with cooking for myself. 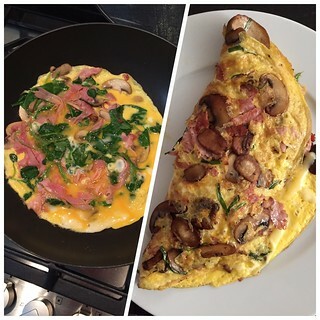 I’ve even managed to make 2 omelettes without converting them to scrambled eggs. Quite a feat for me as I have a tendency to mess with my food when I cook it rather than just leaving it alone to do its own thing. What’s your relationship like with food? Do you eat mindfully? Or are you a dieter/gorger? What steps could you take to improve the way you think about food and the way you eat?